Engines are the heart of every car. Who does not like the sound of a perfectly working engine, especially if it is a luxury car like a Ferrari or a Bentley? Though, big engines can mean more significant expenses on gas. However, with technological advances, engines change as well, making the driving experience more fun and affordable. If you increase the compression ratio inside the engine, you can improve not only performance but also fuel economy. How? The compression ratio is the amount of fuel and air squeezed into the combustion chamber, the part of the combustion engine where the fuel and air mix is burned. When this ratio is higher, it uses fuel more efficiently, meaning you need to spend less money on gas. However, the higher compression ratio can lead to a knocking sound in the car engine, which is a result of high temperature and pressure in the chamber. But don’t worry about car engine repair! Higher octane gas can solve this problem. Furthermore, most car engines mix fuel and air directly before leading them to the combustion chamber, which can, again, cause knocking. 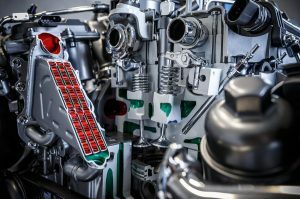 But by combining direct injection with turbocharging, aka forcing pre-compressed air into the combustion chamber, the performance of the car engine is boosted. Electric gasoline-hybrids are not common for luxury cars; however, technological changes make hybrids more attractive. Jaguar and its “push to pass” button try to increase the attractiveness of hybrid car engines. The C-X16 concept is powered by a supercharged 3-liter V-6 gasoline engine combined with an electric motor like regular hybrids are. The difference comes along with the “push to pass” button, which is conveniently located on the steering wheel. Simply press the button and boost the electric motor with 70 horsepower, similar to the KERS system used in the formula 1 racing. Which car fan has not dreamt of being a formula 1 car racer? This new form of a car engine is designed to use cylinders only when they are needed. It is especially important when cars accelerate. The accelerating process of cars usually require all cylinders, however, during the cruising speed, the workload decreases and not all cylinders are required to keep the speed. This advance in engine technology improves fuel efficiency by about 10%, even for luxury cars. Car engines are the heart and soul of every car. If you are in need of car engine maintenance or car engine repair, contact us now to make sure that you can drive your car without any trouble throughout the summer.